So this is the new light toy. 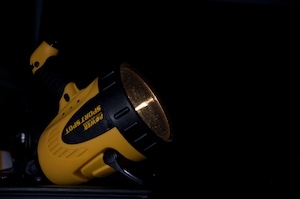 It is a 2 million candle power rechargeable flashlight. It is used for light painting. Most people think of light painting as using small colored lights to make abstract drawings or neon sign type things. Check out Dave Black. This is the type of light painting I want to do. We will have to wait and see if I can get anything close to this, but it should be fun to try. Anyway, when I took this picture I was hoping to get some light from the flashlight in the picture. It put out so much light it lit up the room. It was hard to turn down the exposure to just light up the light with my SB800 which I wanted to do. I guess I needed something to make dust in the air, but I didn’t want to work that hard I guess. I tried briefly to add something in photoshop, but that looked really bad. This entry was posted in Photography by Chris Ward. Bookmark the permalink.